This is an activity about Vivaldi's 4 Seasons. You have 30 hits to recognize the most important moments from this famous work. 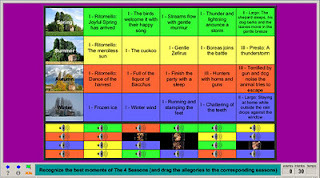 Click on the musical fragments in the small boxes below and drag the cursor to the corresponding moment of each season above. The colors are intended to make the identification easier. The Roman numbers at the beginning of each description indicate the movement the musical fragment is taken from (I = 1st, II = 2nd, III = 3rd movement). The activity is not finished until you haven't identified the Archimboldo allegories too (I know..., they are difficult to see - you can look for them in the Internet). Drag each head to his corresponding season. For a short general introduction with the full sonnets (in English and Spanish translations), click here. For the activity, click on the picture below, it will open in a new window.